So you’ve got a pretty chunk of money to spend on your next dive watch. Which is great, because you arrived at the right place to get a good picture of what’s available on the market. Right off, I’m going to tell you that now is a good time to be in the market for a dive watch. That’s because competition between watch manufacturers has been steadily growing over the last couple of years, with watches packing more features, and prices lowering. What it means is, this is a good time to get a great deal for your money. You can find an awesome high-quality watch at a reasonable price without having to pawn your family gold to buy one. While you could always get a decent dive watch at a price of $500 or even $300, what you always find is that you have to compromise in a way or another. There’s always a quirk of some kind that won’t let you enjoy a timepiece that should satisfy you in all respects. The $1000 (give or take) price point, however, is where you can start to become really demanding. 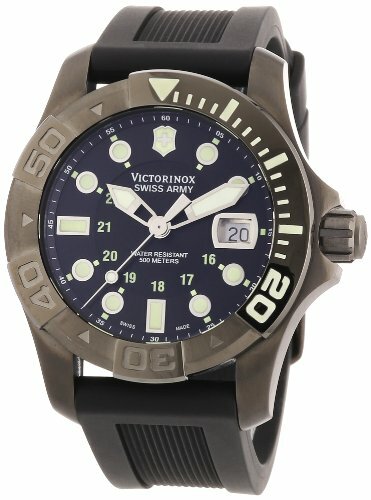 Brands like Victorinox, Citizen, Seiko, etc. offer many types of different models at these prices. Regardless of whether you use it for your professional operations or you are a diving enthusiast, we got you covered, by including in our review the best of the best divers watches around the $1000 price tag. If you’re looking for yet more punch for your buck, check out my other reviews for the top dive watches around $500 and around $300. Or read on to see what’s available at $600-$1200+! 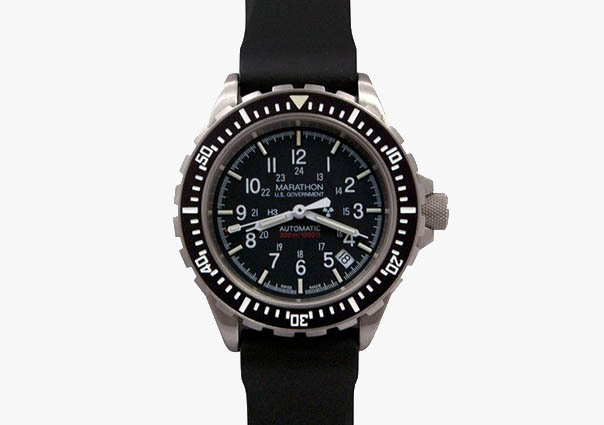 Designed for use by SAR or GSAR (Government Search and Rescue) divers, the Marathon automatic watch is built to withstand extreme conditions. The luminosity of the watch is given by encapsulated tritium gas tubes on the indexes and the hour markers, which ensure high visibility in low light conditions. The 300-meter water resistance and surgical grade stainless steel along with an anti-reflective coated sapphire crystal glass, assure that the Marathon WW194006 will be your reliable partner in either your professional or recreational dives. It is worth mentioning, here are some other models in the same price range with small differences from the WW194006: the WW194006 with the USMC logo, the less expensive quartz WW194018 JSAR, and the WW194018 JSAR with the Canadian Maple Leaf. 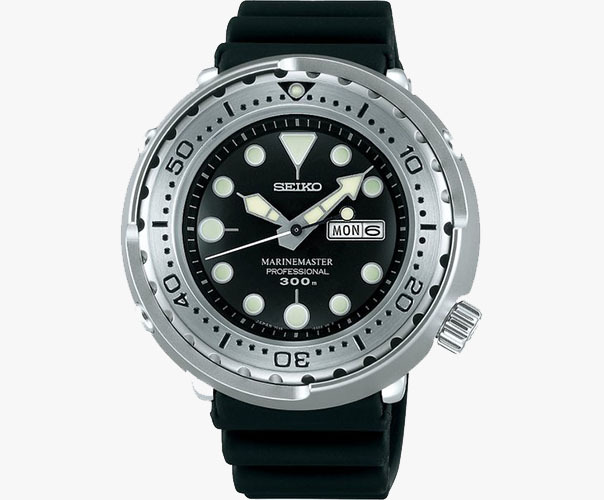 Nicknamed the „Tuna Can”, this Seiko Marine Master is a well-known watch in the diver’s branch, delivering perfection and functionality at a somewhat reasonable price. Whether you ask a professional diver or a hot-blooded scuba enthusiast, they will both tell you that Seiko is one of the most respectable watch companies out there, and specifically, the Seiko „Tuna” being a highly desired timepiece. With a shatterproof proprietary Hardlex crystal dial window, famous Lumibrite fluorescent luminous paint, 300 meters (1000 feet) water resistance and a high-grade stainless steel case, the Seiko Prospex Marine Master is a perfectly reliable companion in your dives. You don’t see very often watches with three screw-down crowns, but believe it or not, this is a much simpler mechanism to operate for a watch with this many functions – after you get the hang of it (read the manual) – than a single crown with multiple contraptions. The 53mm bezel size is impressively large and this should make you think twice if you have tiny wrists. The watch has some special functions that you will hardly find on another watch in this price range, namely the depth meter, and a proprietary Eco-drive self-powering technology that uses the power of the sun to keep the watch in operation. Finally, the case is made from stainless steel featuring an unidirectional bezel along with a mineral crystal window. 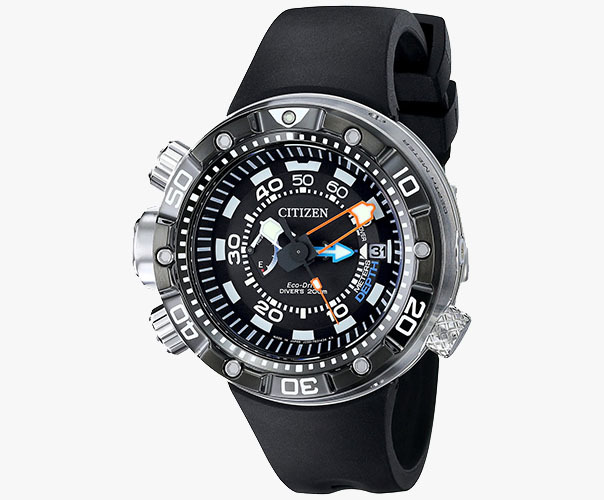 The Citizen Promaster BN2029-01E remains a good option in our line-up of the best divers watches around the $1000 price point. 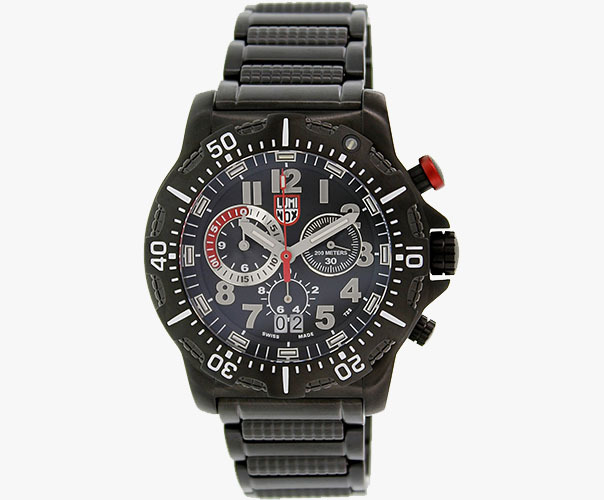 Luminox took some interesting risks on this watch. One of them is that they didn’t use some fancy big luminous indexes or markers and, at first, it may seem this watch threatens to do a bad job in the dark, but actually the indexes are visible even in very dark conditions due to the tritium-based lighting. As special functions, you get a chronograph with three sub-dials displaying: 60 seconds, dual 12 hours / 30 minute and 1/10th of a second. The window is made of anti-reflective sapphire crystal which is resistant to even the hardest shocks and scratches. Quite an astounding digital timepiece from G-Shock, this new Frogman comes in a vibrant navy blue color that will make you the envy of the group. The GF1000NV-2 has got all the bells and whistles of the Frogman series, such as Moon Age/Phase and a Tide Graph. 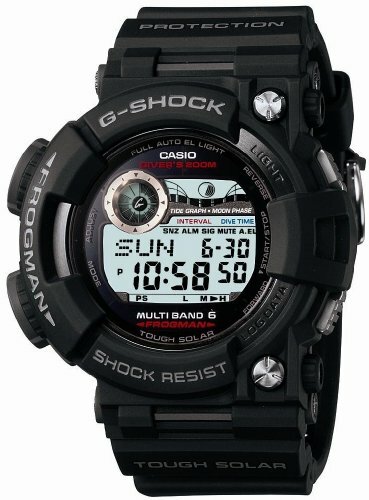 But as opposed to the less expensive Frogmans, this watch is based on the Master of G series Triple Sensor which includes direction, altitude/barometric pressure, and temperature sensors, for a complete watch for the true marine enthusiast. Tough Solar is also included, which makes for a virtually maintenance-free watch. But at close to 2 inches (53 millimeters) in size, this watch is not for the faint of heart. At the price, this watch is a true bargain. It comes with a chronograph, an ETA caliber 251.262 which is an upper-level quartz movement that is deadly accurate, big fluorescent dots replacing the hour indexes, and thick hands, unidirectional bezel, and a huge 500m water resistance. The Victorinox Dive Master is just waiting to be put through the wringer because it will surely be able to handle everything you throw at it (even Nitric and Sulfuric acids that are tested by the company on the case as part of quality tests). The sapphire crystal dial window, that can withstand persistent scratches and shocks, is mounted on a gunmetal stainless steel case that’s beautifully crafted under strict conditions for your pleasure and comfort. Illumination: High contrast between the black dial and fluorescent luminous hands and dot hour markers. What’s not to love in this navy blue dial and band with yellowish accents, and gunmetal bezel? Really stylish choice of colors, on top of a great diver watch! I hope these reviews are bringing home the point that high quality watches with top functions can be found at decent prices. Features that were some time ago available only in multiple thousand dollar price ranges, are now available in the $1000 range or below. Now is a good time for you to start weighing the pros and cons and decide which is the best dive watch around $1000 for you.